With the introduction of a television large enough to be a temptation this past Christmas, I knew I needed to establish a way to control screen time. 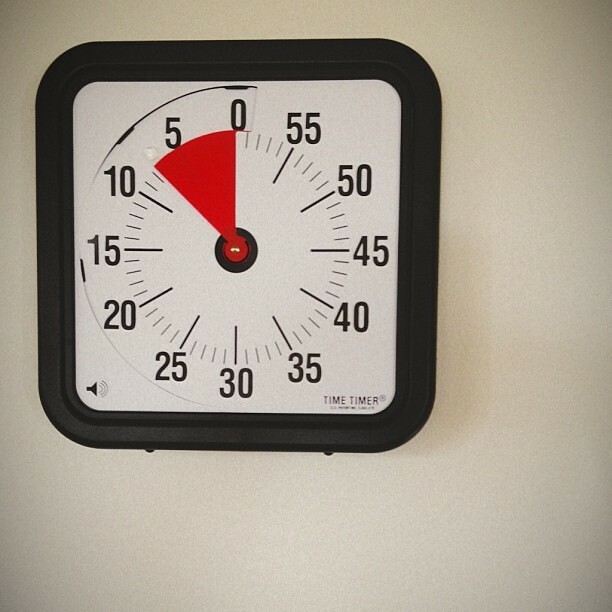 But it needed to work for kids who are too young to set a timer, read an analogue clock, or even know their numbers. Also - it needed to not be hideous. So long as we installed it high enough to keep Sir O from sabotaging it, it was perfect. You just set it for any length of time up to 1 hour, and the kids can gauge how much time is left by watching the red disappear. There's an optional alarm that can go off when time is up, and then it's pretty clear to everyone that it's time to turn the TV off. And it's not like I'm springing it on the unsuspecting children. Everyone's happy. Well no, they're never happy to turn the TV off. But at least they aren't as prone to act as though I'm asking them to peel their own skin off. I'll take it.